Syria is a nation in Western Asia bordered by Lebanon, Turkey, Iraq, Jordan, and Israel. The total population of Syria increased substantially from 2000 until 2010, reaching 21.4 million inhabitants in 2010. However, due to the constant war within Syria’s borders, that number has since declined, and today the total population of Syria cannot be determined exactly. In general, data in Syria after 2010 are hard to come by due to the turmoil. During the Arab Spring in 2011, the economy in Syria was experiencing high unemployment, corruption, and political repression. Protesters demanded that long-time Syrian leader Bashar al-Assad step down, but the protests were ineffective. Since 2011, the armed resistance against the regime has been growing constantly and violence has been increasing. By the summer of 2012, the fighting had spread to Syria’s largest city, Aleppo. 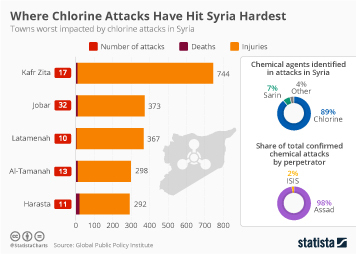 Since the beginning of the Syrian civil war, there have been more than 115 thousand civilian casualties, and almost 6 percent of all deaths in Syria are caused by terrorist attacks. Due to the high number of casualties, millions of people have fled Syria and population growth rates, which seemed to have stabilized around 2007, have become negative due to war deaths and emigration. Despite the unrest in Syria being a result of the poor economic situation, the GDP grew significantly from 2001 until 2010. However, unemployment rates in Syria have unsurprisingly remained exceedingly high. In comparison to other nations in the Middle East, Syria has one of the highest unemployment rates. Both the Syrian population and economy are suffering greatly under the ongoing war, causing many Syrians to leave their home permanently. More interesting topics from the industry "Syria"